IEEE 802.3bz, NBASE-T and MGBASE-T refer to efforts to produce a standard for Ethernet over twisted pair copper wire at speeds of 2.5 Gbit/s and 5 Gbit/s. This would create intermediate speeds between existing standards Gigabit Ethernet and 10 Gigabit Ethernet. The resulting standards are named 2.5GBASE-T and 5GBASE-T.
IEEE 802.3's "2.5G/5GBASE-T Task Force" started working on the 2.5GBASE-T and 5GBASE-T standards in March 2015. On September 23, 2016, The IEEE-SA Standards Board approved IEEE Std 802.3bz-2016. 5 Gbit/s up to 100 m of Cat 5e "on defined use cases and deployment configurations"
The physical (PHY) layer transmission technology of IEEE 802.3bz is based on 10GBASE-T, but operates at a lower signaling rate. By reducing the original signal rate to ​1⁄4 or ​1⁄2, the transfer rate drops to 2.5 or 5 Gbit/s, respectively. The spectral bandwidth of the signal is reduced accordingly, lowering the requirements on the cabling, so that 2.5GBASE-T and 5GBASE-T can be deployed at a cable length of 100 m on unshielded Cat 5e and Cat 6 twisted-pair cables, respectively. Unlike the preceding 10GBASE-T standard, equipment manufacturers have indicated their intention to implement 802.3at type Power over Ethernet on certain types of NBASE-T switches. This implementation is intended to support high-bandwidth wireless access points (802.11ac / 802.11ax) which exceed the speed capabilities of existing 1000BASE-T Power over Ethernet connections. ^ At shorter cable length, it is possible to use cables of a lower grade than what is required for 100 m. For example it is possible to use 10GBASE-T on a Cat 6 cable of 55 m or less. Likewise 5GBASE-T is expected to work with Cat 5e in most use cases. 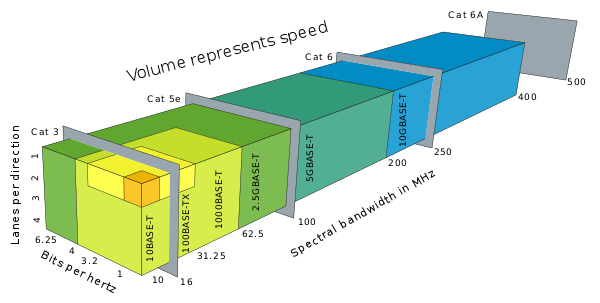 The intermediate speeds became relevant around 2014 as it became clear that it would not be possible to run 10GBASE-T over the Cat5e cable that had been used for the wiring in many buildings but that, with the development of fast WiFi protocols such as IEEE 802.11ac, there was a significant demand for cheap uplink faster than 1000BASE-T offered. IEEE 802.3bz will also support Power over Ethernet, which has generally not been available at 10GBASE-T.
As early as 2013 the Intel Avoton server processors integrated 2.5 Gbit/s Ethernet ports. Whilst Broadcom had announced a series of 2.5 Gbit/s transceiver ICs, 2.5 Gbit/s switch hardware was not widely commercially available at that point; 10GBASE-T switches do not generally support the intermediate speeds. In October 2014 the NBASE-T Alliance was founded, initially comprising Cisco, Aquantia, Freescale and Xilinx. By May 2015  it had expanded to 34 members covering most producers of networking hardware. The competing MGBASE-T Alliance, stating the same faster Gigabit Ethernet objectives, was founded in December 2014. In contrast to NBASE-T, the MGBASE-T says that their specifications will be open source. With the forming of the IEEE 802.3bz draft standard under the patronage of the Ethernet Alliance in June 2015, the two NBASE-T and MGBASE-T Alliances are forced to collaborate. The NBASE-T Alliance was founded in 2014 by Aquantia Corporation, Cisco Systems, Freescale Semiconductor and Xilinx. It now consists of more than 45 companies, and aims to have their specification compatible with 802.3bz. ^ "IEEE P802.3bz 2.5G/5GBASE-T Task Force". IEEE Standards Association. ^ "New IEEE P802.3bz™ Project Achieves Significant Milestone Towards Enabling Higher Speeds Over Installed Base of Twisted Pair Cabling". IEEE Standards Association. ^ "IEEE's 802.3BZ Task Force Mediates MGBASE-T and NBASE-T Alliances". Planetech USA. Archived from the original on 2015-11-22. Retrieved 2015-11-22. ^ "IEEE 802.3bz Project PAR" (PDF). IEEE 802.3bz Task Force. Retrieved 2015-09-22. ^ "[802.3_NGBASET] FW: Approval of IEEE Std 802.3bz 2.5GBASE-T and 5GBASE-T". IEEE P802.3bz Task Force. Retrieved 2016-09-24. ^ "Next Generation Enterprise Access BASE-T PHY Objectives" (PDF). IEEE P802.3bz 2.5G/5GBASE-T Task Force. ^ "Cisco Live BRKCRS-3900, slide 41, time 57:40". Archived from the original on 2016-03-03. Retrieved 2016-01-15. ^ "Technology". NBASE-T. NBASE-T Alliance. 2015. Retrieved 2015-10-18. ^ "Broadcom Announces New High-Performance Multi-Rate Gigabit PHYs". ^ "Industry Leaders Form NBASE-T Alliance to Promote Multi-Gigabit Ethernet Technology for Enterprise Wired and Wireless Access Networks". ^ "NBASE-T Alliance Jumps to 34 Members". ^ "Open Industry Alliance and IEEE to Bring 2.5G and 5G Ethernet Speeds to Enterprise Access Points". ^ "Want 2.5G/5G BASE-T Connections? They're coming". ^ "IEEE's 802.3BZ Task Force Mediates MGBASE-T and NBASE-T Alliances". Archived from the original on 2015-11-22. Retrieved 2015-11-22. ^ "The NBASE-T Alliance℠". NBASE-T Alliance, Inc. Retrieved 30 December 2015. ^ "Oh What a Year!". NBASE-T Alliance, Inc. Retrieved 30 December 2015.